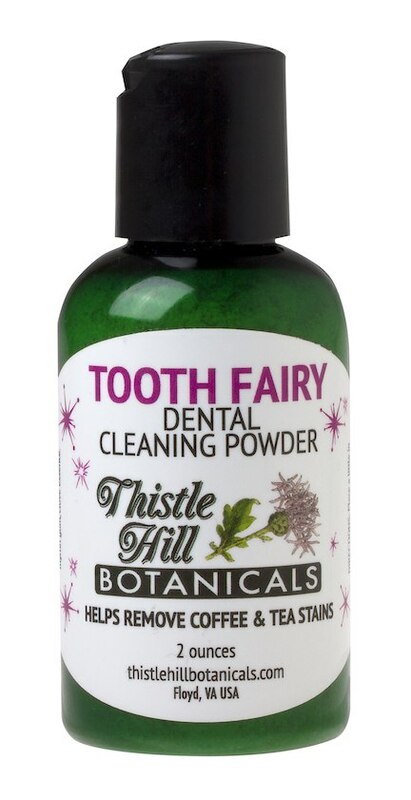 For more than 8 years now Thistle Hill Botanicals has been making, selling and personally using our Tooth Fairy Dental Cleaning Powder. We have received nothing but GREAT reviews from our customers (and from my dental hygienist) Our ingredients are ALL Natural, Cruelty Free and Vegan, and include ingredients that mother nature herself approves of! What is NOT in it? NO chemicals or synthetic bad stuff at all! NO whiteners: Our Tooth Fairy Dental Cleaning Powder will help you get to your NATURAL enamel color, it will NOT make your teeth dayglow white. A little goes a long way and our bottle will last you months and only costs $9.50! It is shelf stable and EASY to travel with. Please Share with your friends, they will Thank You!